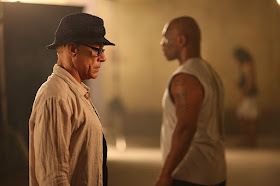 Kickboxer: Retaliation continues the story of Kurt Sloane 12 months after he avenged his brother's death. Vowing to never return to Thailand after the events that happened the year before, the film picks up in a crowded sports arena with cheering fans where Kurt is now in a new battle - a title bout for the MMA World Championship when Kurt Sloane is lured back to Bangkok, Thailand. Now back in the underworld of no holds barred fighting matches to the death, Kurt must endure new forms of training and be ready to fight for his life once again. Kickboxer: Retaliation was written and directed by Dimitri Logothetis, and stars Jean-Claude Van Damme, Mike Tyson, Alain Moussi (World's top martial artist), Hafþór Júlíus Björnsson (HBO's Game of Thrones), Christopher Lamber (Highlander), and a collection of the world's top MMA fighters. 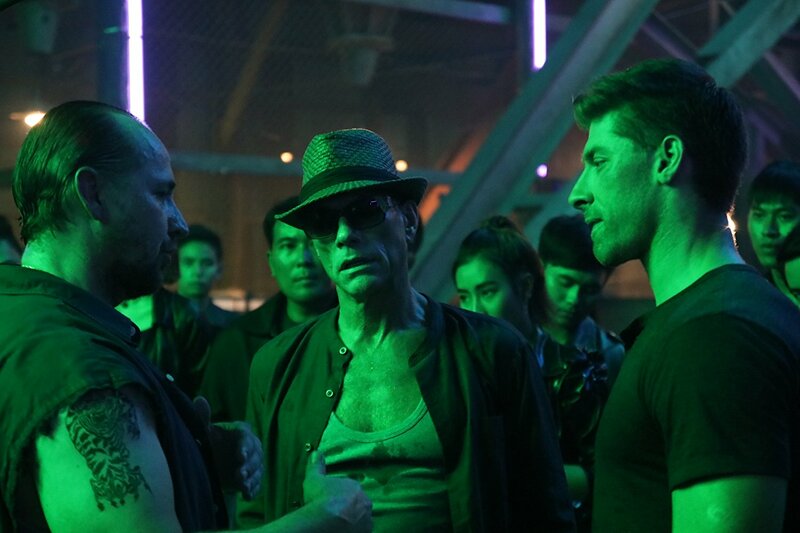 Dimitri brings the spirit of the original 80's classic to a new era, and for those seeking adventure, nostalgia, and the worlds best martial arts on film, Kickboxer: Retaliation is a must-see. 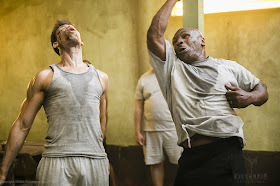 A black belt himself, director/writer Dimitri Logothetis helmed last year's international hit Kickboxer: Vengeance, which Variety hailed in its review as "well-crafted good fun - and good proof that you don't need more than two hours or $100 million to give ticket buyers their money's worth in popcorn thrills." 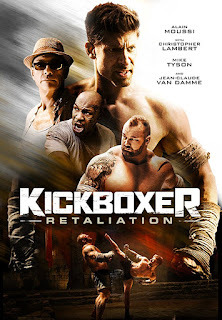 Featuring unedited long takes, Dimitri captures real martial artists, not CGI special effects or heavily edited stuntman. By the time he was in his late 20's, Dimitri Logothetis was already one of the youngest heads of programming in the largest cable television company in the United States. In addition to becoming co-chairman and owner of two production companies, he won countless awards as a director and producer. His film Champions Forever became the best-selling documentary video in history. He has Executive Produced forty hours of scripted series television, directed twenty-one hours, directed nine feature films, and produced six feature films. He has worked with Martin Scorsese, Robert De Niro and Stacey Keach. Dimitri developed and produced a highly successful Stephen King movie, Sleepwalkers, and has written a television mini-series for Warner Brothers and Turner. He executive produced and ran two television series productions for Warner Brothers. He is now the President of Kings Road Entertainment. In addition, he has run three companies, managed over one thousand employees all over the world, and implemented over two hundred million dollars of production financing in the last ten years. 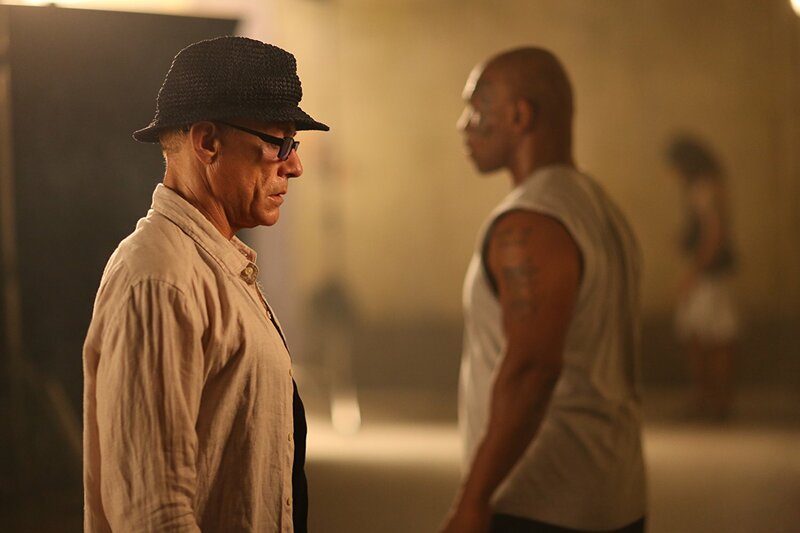 You can read our review of Kickboxer: Retaliation here. We spoke to director Dimitri Logothetis about the film. TMS: Not too long after Vengeance was released Retaliation was officially announced. How much of Retaliation’s script was done before the first film? DL: Not Much. I basically had an idea of where to go and I was really sort of focused on finishing the first film, so I didn't have any of it done. But, there was a lot that made sense in terms of what direction to go to in the sequel. TMS: The first was an excellent action packed thrill ride. How much concentration did you put into topping the first one? DL: Well, on the first one we had a number of production problems that sort of hindered completing the film and we overcame those, but the film started and stopped. So for me, not only did i write the film, but I ended up directing it as well and I have a very big action background from television doing quite a bit television action as a director. And also I'm a former martial artist myself, and so I had a very vivid approach in my mind as to how I wanted to approach the action. I also wanted to do some signature things that would make sure that we were an authentic martial arts film, that we weren't relying on any special effects, or wires, or a number of things that everybody else relies on because I knew that I had an exceptional martial artist in Alain Moussi. So I designed some sequences, one of them being a oner where he takes out seventeen opponents at one time without ever cutting the camera. TMS: You're talking about the prison fight scene that follows Moussi up the stairs and onto some scaffolding as he fights various prisoners? DL: Yes, that's the first oner and then other oner is by the river. TMS: I was going to ask about that scene. I wondered if it was one continuous take or if there was possibly a cut that I missed. DL: No, it's one continuous shot. It's funny because when I first finished it, the editor tried to cut it and I got really mad at him. I said, "Are you kidding me? I spent all this time rehearsing this, we're playing it as is. It's an amazing shot." I like that kind of stuff because for me martial arts film are about, unlike the special effects oriented superhero movies, in a martial arts film the kid in all of us can see the movie and think to themselves, "Wow! If it's possible for me to train with that particular martial arts guru, I may be able to do a lot of the cool stuff that that guy is doing." That's the whole point. The more authentic you can be, the more the audience can deep down in their soul feel it. TMS: Definitely. Those are the ones that I feel are the most memorable for me, the likes of Jackie Chan, Gordon Liu, the Shaw Brothers' film and others that don't focus on wirework and everything is real and that's part of the great thing about it. DL: And you appreciate the athleticism. You're looking at this stuff and you're thinking to yourself, "Wow!" I'm as much of a little kid as anybody else, and I'm sure you are as well. When you look at this athlete and he jumps into the air and he does a triple on his own, which Alain can do, it's amazing. Remember, he weighs over 200 pounds. He doesn't weigh what Jackie Chan weighs, which is roughly 150 in his heyday. You know, it's completely different. Alain does a front aerial and a back aerial. Alain does a triple in the movie. It's pretty amazing to see that kind of athleticism and you appreciate it. I think the audience appreciates it. He's a sixth degree jui-jitsu master and I think without that starting point, we really don't have anywhere to go. TMS: So how many takes did you have to go through to get the one continuous take of the prison scene? DL: Well I have an amazing stunt team in Thailand and it's led by a fella named Jean-Francois Lachapelle. He has a team and what they did is they rehearsed the stunt for about a week and then we shot it. So I came in and believe it or not, we pulled it off in three takes. DL: Because Alain is really kicking guys in the head, he's really kicking guys in the stomach and hitting them. And even though he's not doing it with full contact, after around the second or third take you can see these guys get woozy. They can't stand up straight anymore, you know what I mean? A lot of people will that he's not even hitting them that hard, well let him kick you in the head not that hard and see how it feels after two kicks. TMS: How were the fight scenes crafted? Were they fully developed in the script or more developed on the set? DL: What I do is I write a very loose script and then I work with the stunt guys and I talk to the stunt guys over the phone. They know me really well because I've worked with them now. They have a team of about thirty and the Thai stunt guys are some of the best in the world. And then what they'll do is, based off our conversations back and forth they'll go and shoot a previs. They'll set up this pretty amazing previs in their dojo, where they will actually go through a stunt and show me. They'll even light, and they'll cut it, and the'll show me what we discussed. And then I'll modify that and they'll go back and do it, and we'll work back and forth until I like it. Then I'll start to share that with the DP, and I'll start to share that with Alain and he'll start to work on it himself. He'll say, "Let's change this, let's do that." So before we hit Thailand or before we hit any set, we've pretty much seen what we're going to do and then we'll start to execute it. There's several months before that, where we work out all the stunts and we actually see them. Because today, you can shoot all this stuff on your phone and cut it together. These guys are fantastic. Not only are they fantastic stunt guys, there great at shooting their sequences and showing us what we're going to approach. And then the DP has his input, and Alain has his input, and we modify it from there. TMS: Can you talk a little bit about the casting process. How did you come to cast Mike Tyson, Christopher Lambert, and Hafbor Bjornsson. DL: Well, my producing partner Rob Hickman suggest to me very early on, right after we finished Vengeance, he said,"You gotta meet this guy who is The Mountain in Game of Thrones." We went to a UFC fight in Vegas, you can actually see a picture of us on the website, and that's when we first met him. I just looked at this guy and I said to myself, "This can't really be a human (laughs)." You know, I stood next to him, and he's a great guy, but c'mon man he weighs over 400 pounds. It doesn't make any sense. And, he's got a ripped stomach. When you stand there and you stare at those biceps, you're standing next to him, it's just overwhelming. So I thought to myself, "You know, if I put a guy in front of Alain, and Alain is 6'1 and weighs 205 pounds, who outweighs him by 200 pounds it's gonna be more than overwhelming. And obviously it is. And Mike Tyson. We talked about Mike Tyson early on and as you know, we try to bring in authentic world champions from the fight game. With Dave Bautista, we ended up having someone who is a legend in the WWE. And he was perfect for Tong Po, he happens to be half Phillipino so it was perfect for him to play the part of Tong Po. So, we always want to have that authenticity. I grew up watching The Dirty Dozen and The Longest Yard with Burt Reynolds and they always managed to have these really well known athletes that were accomplished in their own game. And it made it kind of cool, because if you were a guy that liked action to bring in like a Jim Brown into a movie was something that was kinda cool. 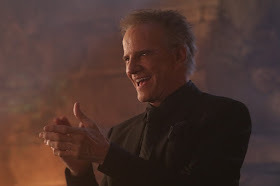 TMS: And what about Christopher Lambert? DL: Well Christopher Lambert belongs in the film. He comes from a pedigree of martial arts. He was the one and so we found out if he was available or not. He's a terrific actor. As soon as I found out that he was available, I got him on the phone and he just was all over it. He was thrilled to do it. And then I designed a sword-fighting scene, so that we could build in a little homage to his Highlander days. In fact, I have up on my wall a replica of the Highlander sword. I saw it one day at this antique gun store and I said, "Ok, I gotta buy that." That was just one of the coolest films. And of course he's in Mortal Kombat, so the audience really responds well to him and he can see that he's a wonderful actor. TMS: I agree, he's an icon of the '80s and 90's. So, what are some of the benefits and challenges to filming in Thailand? DL: Well for me it's all benefits, Thailand and Asia itself. I just came back from China. I was invited to China, because they would like for me to start shooting my stuff over there. First of all, the difference between North America and Asia is that in Asia, martial arts films are The Godfather of movies. It's about honor, it's about respect, it's about loyalty, it's all the values that are meaningful to them. Protecting family. Here, it has always been viewed as kind of a secondary film or a guilty pleasure. But, I grew up watching all those guilty pleasures and I think we've proven the popularity of these films. If you look at how we're doing on iTunes right now, we broke the top 10 in Canada. We're number 8, up against all of the major motion pictures. Here in the US, in action/adventure we were number 12 last night. Again, up against all major motion pictures. Our domestic distributor doesn't have any advertising, so this is just the audience responding to the movie and saying, "Hey man, you should this out. It's a really good film." TMS: Tyson is a delight. Did he surprise you at all with his performance? TMS: Did Tyson's role expand at all from when he was first cast? DL: It did, once I saw how good he was. We started shooting with him in Las Vegas, because we had to shoot some stuff in Las Vegas. The interior of the prison was shot there, because a number of people couldn't go to Thailand; Ronaldinho, etc. And so when I saw how good he was, I said listen, "We got to bring him to Thailand." So, we found out what his availability was. He had just finished shooting the Donnie Yen Ip Man 3 and so we figured out how to get him over to us right around the time that he was finishing that. TMS: The final fight scene is absolutely brutal? How long did it take to shoot the finale? Was it as physically demanding as it looked? DL: But see that's the kind of stuff again man, it's cool when you're standing on the set and you're watching it. I have as much fun making them as people have watching this stuff. Who the hell can do that? Only the strongest man in the world, right? It was tremendously brutal on Alain. But, the thing that I'll tell you is that Alain is obviously a terrific martial artist. However, what he's really great at and what he's know for is being able to be hit, get hit, and take a fall better than anyone you've ever met and be able to get up and continue without getting hurt. I don't know how the hell he does it. I think he's a genetic specimen, besides working out all the time, because I put in twelve hours days with him and at the end of the day he'd say, "C'mon, can we do more? Can we do a little more?" TMS: You had another strong man in the film, Brian Shaw. He's not know for fight scenes, but the one he had with Moussi in a training montage was pretty good. Did he go through an extensive run through of that fight? DL: No. Alain worked with him in the day and we were standing there in that hallway, which was in Las Vegas. 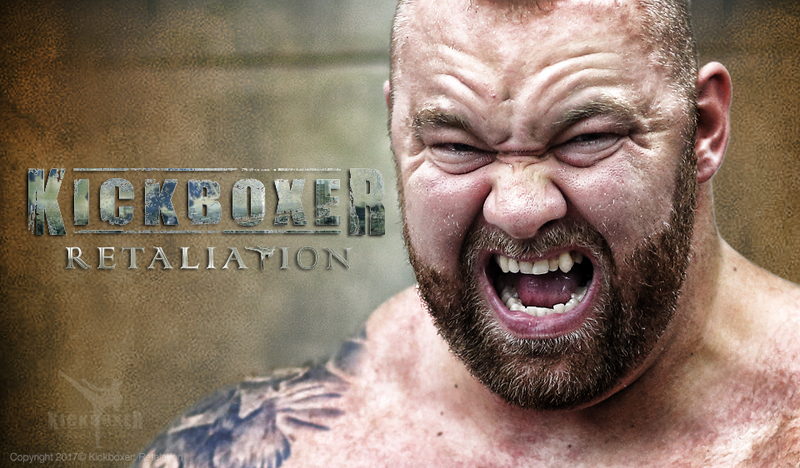 Brian is now the strongest man in the world, he won the title and Hafþór is the European world champion. And he's still competing, he wants win the title. But, I said to Brian, "Can you pick Alain up by the neck?" And Brian looked me and again he just said, "Sure." So, he grabes him by the neck and lifts him straight up in the air. I think he was holding him up what fourteen feet. By one hand. Again, it's just the kind of stuff you look and you go, "Uh, this can't possibly be real." And you know, it is. TMS: Are there plans for a third film? 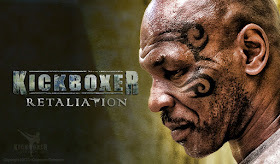 DL: I finished writing the third film about a month and a half ago, it's called Kickboxer: Armageddon. If you like Retaliation, Kickboxer: Armageddon will blow your mind. The kind of fight sequences that I have for this are going to take us to a totally different level. I have a oner planned that's going to top the oner in Retaliation. It's going to take us to a completely different level and we're just excited and we're just looking forward to having a lot of fun doing that. And we're bringing back Mike Tyson. TMS: Awesome. I was wondering about that, because he's incredible. DL: Oh yeah, we're bringing back Mike Tyson. I'm excited to do it. He's excited to do it. He's been plugging the movie all across the country. We're bringing back Christopher Lambert. We're bringing back Ronaldinho in a really cool sequence. And we're working on Neymar and if we get Neymar, we'll have the two biggest soccer players on the planet. They're going to do some really cool kicking sequences that you haven't seen before, something the audience is going to delight at. Of course, we're going to bring back some wonderful world champions. We're talking to George St. Pierre, because I'd love to bring him back. He just won the world championship back, he was the comeback kid. I was in New York watching it. And so, we've got some really incredible things planned for Armageddon, so we're very excited about that. We plane to start shooting the Vegas sequence in March. We're talking to Snoop Dog to come in and do a little bit of work on it. We're talking to Team Alpha Male, who is a big UFC team. We're talking to Uriah Faber from Team Alpha Male. We're talking to Cody Garbrandt. SO, we're going to have a whole crew of wonderful, authentic UFC fighters; in addition to some incredible sequences that are going to completely blow everybody's mind. TMS: Do you a main villain planned or someone in mind? DL: I have three main villains for Armageddon. So, we're going to have three villains that obviously work for Mr. Moore, spelled More because he always brings back more. And that's Lambert, he is the mastermind. He's going to up the game this time. And so, it's just going to be really, really cool.